I've been meaning to blog about this delicious Spring dish and not even the pleading of Facebook friends who saw the photo the night I made it has gotten me closer to doing it, until now. I guess life has been busy. June is a whirlwind lately, full of energy and sass and plenty of words. She is the most talkative little girl I've ever seen. She pretty much can express anything she wants to with limited words and it's really fun, mostly. Until she says something like "Go away mama." That hurts and happened only once, but I think it goes along with having a toddler. Their worlds are so frustratingly small at the same time that they are developing so fast and they can't get there fast enough for their little minds to be happy. And we're always telling them "No" and "Be careful" and "Do this and Do that" that sometimes I just want to let her do whatever she wants and not get in the way. Luckily, I have not really had to discipline her too much as she's pretty mellow and hardly ever throws a tantrum. I can count on one hand the number of times she's done something that resembled a tantrum and I'm grateful. But some days are still hard... and long. She's on Spring break from the Mom's day out program this week and we're having fun. 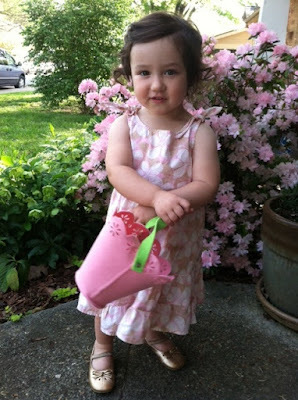 Here she is last weekend at the neighborhood Easter Egg Hunt. I love this photo and we had such a good time that day. But back to the chicken. This was one of those dishes that I got inspired to make from one of my magazines. It was in April Food and Wine. And I will go back to it again and again because it was so easy and turned out so beautifully. We practically licked our plates when it was gone. Isn't it just Spring in a dish? So here is the recipe. I tweaked it a bit and added little tiny French green beans that I had in the freezer, plus halved the amount of leeks and added an onion since that's what I had. And instead of creme fraiche, used sour cream because it's essentially the same thing and easier to find. I almost always have some in the fridge. If you make it, let me know how it turns out! here is miss sassypants in the new hat and sunglasses her Papa got her for our trip to the beach in a couple of weeks. Going to be a big weekend for cooking and entertaining. We're having family and friends over for Easter brunch on Sunday and June and I will dye eggs and hide them in the backyard for her and her friends. Also having some friends over for dinner who we haven't seen in a long time so I'm looking forward to a busy weekend of cooking, baking and enjoying everyone's company. Happy Easter!